In a medium bowl, whisk together the flour, baking powder, baking soda and salt; set aside. Combine the butter, both sugars and glucose in the bowl of a stand mixer fitted with the paddle attachment and cream together on medium-high speed for 2 to 3 minutes. Scrape down the sides of the bowl, add the egg and vanilla, and continue to beat for 7 to 8 minutes. Reduce mixer speed to low and add the flour mixture. Mix just until the dough comes together, no longer than 1 minute. Scrape down the sides of the bowl with a spatula. Still on low speed, add the chocolate chips, butterscotch chips, graham mixture, oats and coffee, and mix until just incorporated, about 30 seconds. Add the potato chips and pretzels and again, mix only until barely incorporated, 15 to 20 seconds. In a medium bowl whisk together the flour, cocoa powder, salt and baking powder. In a large mixing bowl, cream together the butter and sugar until light and fluffy. Add the water, egg, vanilla, and peppermint and beat until fully incorporated. Working in batches, add the flour and cocoa powder mixture beating until just combined. Turn the dough out onto a large sheet of plastic wrap. Roll into a log shape, roughly 3 inch in diameter, and wrap tightly. Place in fridge and allow to harden up for 4 hours or overnight. When ready to bake, preheat the oven to 325*F. Line a baking sheet with parchment paper or a silpat. Remove the firm dough from the fridge and unwrap. Slice into thin discs (about 1/4inch thick), and line the baking sheets. You can have them pretty close together as they will not spread. Bake for 16-18 minutes. Its hard to tell when these are done because of their dark color so test for firmness around the edges. Allow to cool on the baking sheet before transferring to a cooling rack. Line a baking sheet with foil. 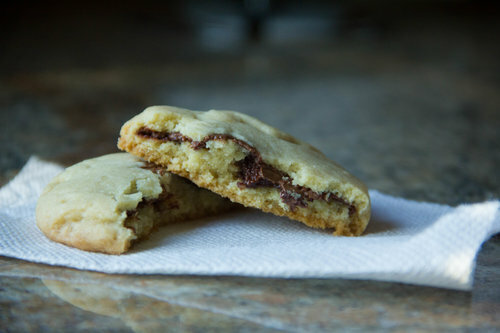 Drop 20-24 teaspoons of Nutella onto the baking sheet leaving space between each one. Freeze for 3-4 hours or overnight. Then prepare the dough. Beat in the dry ingredients until combined. Wrap the bowl tightly with plastic wrap and allow to set up slightly in the fridge for 30 minutes. Remove from fridge and preheat the oven to 350*F. Line a baking sheet with parchment paper or a silpat. Roll about a tablespoon of dough at a time into a ball, then flatten into thin discs. Peel a frozen glob of the Nutella off the foil and place in the middle of the dough. Wrap and press the dough around the frozen spread, trying your best to fully cover and not allow any to poke through. Line the baking sheets with the cookies leaving about 2 inches in between each. One the sheet is full, put into the fridge and allow to set up for 15-20 minutes. Bake for 18-20 minutes, rotating the pan halfway through, or until the edges are a nice light golden brown. Allow to cool on the pan for a minute or two then transfer to a cooling rack. Best served slightly warm. 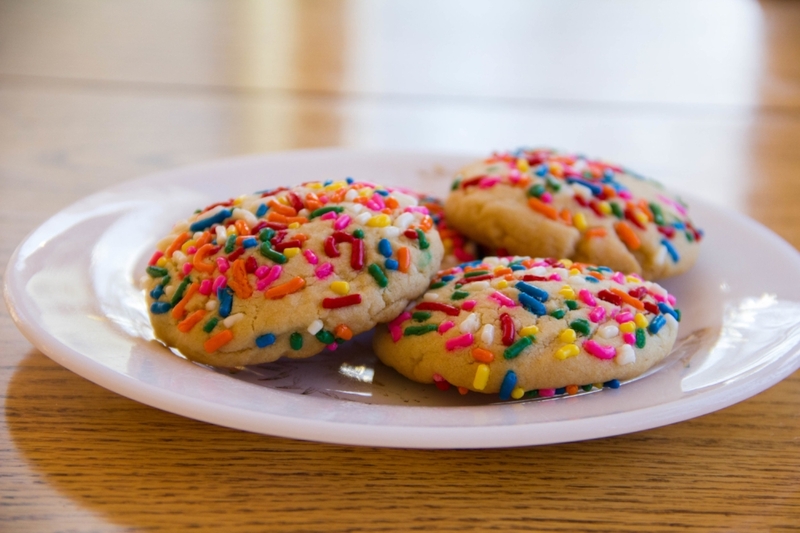 Spread the sprinkles on a large plate. Roll about a tablespoon of dough at a time into a ball, then press down into the sprinkles, flipping and pressing down both sides. The cookies should be about 1/8-1/4 inch thick discs. Line the baking sheets with the cookies leaving about 2 inches in between each. Bake for 18-20 minutes, rotating the pan halfway through, or until the edges are a nice light golden brown. Allow to cool on the pan for a minute or two then transfer to a cooling rack. Be sure to remove the cookies from the baking pan before they cool completely to avoid the sprinkles on the bottom from sticking to the pan. In a large mixing bowl, cream together the butter and brown sugar until light and fluffy. Add the egg and the molasses and beat until just combined. In a separate bowl, whisk together the dry ingredients to evenly disburse the spices. Slowly add to the butter/molasses mixture, mixing until just incorporated. Add the chopped ginger and pulse until distributed throughout the dough. Wrap the bowl tightly and allow to rest in the fridge for an hour or so. You are just looking for them to firm up a bit so they are easier to shape. After an hour, preheat the oven to 375*F and line your baking sheet(s) with parchment paper or a silpat. Pour the extra sugar/turbinado sugar to a bowl or small plate. Roll roughly a tablespoon of the dough between your hands, then press into the sugar, making sure to coat both sides. 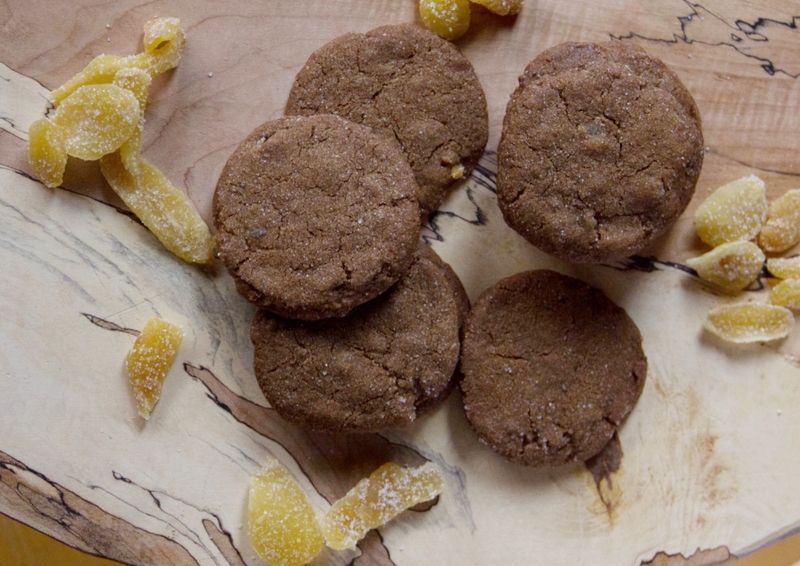 You should for each ball into a disc shape and line the baking sheet, leaving roughly 2 inches between cookies. 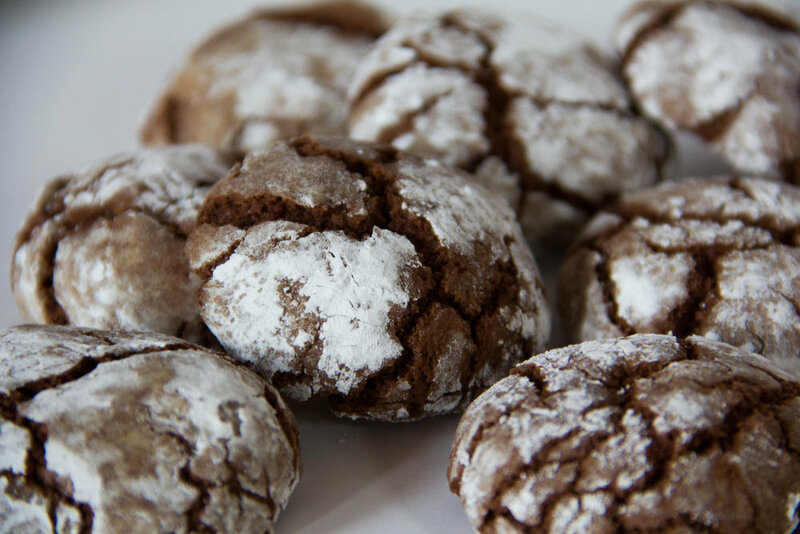 Bake for 9-10 minutes or until the cookies' edges are firm and the centers are most of the way set. Allow to rest on the baking sheet for 5 minutes then transfer to a cooling rack. In a large mixing bowl, cream together the butter, both sugars, salt, and applesauce. The mix should be light in color and fluffy. Add in the vanilla and mix until combined. Add in the flour and and beat until almost completely mixed in, then add the chocolate chips and mix for a minute longer until the flour is incorporated and the chocolate is evenly disbursed. Scoop out a tablespoon or so and serve! On a well floured surface, roll out the defrosted puff pastry dough slightly. The rectangle will be roughly 12 inches x 18 inches. Cut the sheet of dough into 14 strips (roughly 1 inch x 12 inches). Line two baking sheets with silpats or parchment paper (or work in two batches if you only have one sheet pan). On a plate or sheet pan, mix together both sugars and the cinnamon. Brush one side of each strip of dough with a little water, then press the wet side of the dough into the cinnamon sugar mixture so there is a somewhat thick layer of sugar adhered to the dough. Hold either side of the strip, twist in opposite directs to achieve the spiral effect. You will want to twist somewhat tight as they will open as they bake. 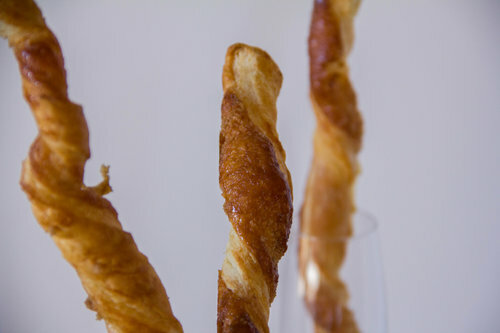 Lay each twist onto the baking sheet, pressing down the ends to hold in place. Place 6 or 7 twists on each sheet pan. Once you have all the dough twisted and on the sheet pans, place the twists in the freezer for 15-20 minutes to allow to harden slightly. This step will help the twists maintain their shape as they bake. Preheat the oven to 400*F. Take the sheet pan straight from the freezer into the oven. Bake for 12-15 minutes, or until the pastry is golden brown and the sugar has caramelized. Allow to cool completely on the sheet pan. Preheat the oven to 350*F and line a baking sheet with a silpat or parchment paper. Beat together the butter, oil, sugar, and brown sugar until light and fluffy. Add eggs one at time, beating until just incorporated. Mix in the vanilla and the espresso powder and beat until evenly distributed. In a separate bowl whisk together the flour, baking powder, cocoa powder, and salt. Add slowly to the butter mixture, beating until combined. Pour the powdered sugar into a bowl or onto a plate. Scoop heaping tablespoon balls of the cookie dough and toss in the powdered sugar until well coated. Place each cookie dough ball on the baking sheet leaving about 2 inches between each cookie. Bake for 12-13 minutes. The tops will be cracked and the edges will be firm. Allow to cool for 5 or so minutes on the cookie sheet, then transfer to a wire rack to finish cooling. In a mixing bowl, beat together the butter and both sugars until light and fluffy. Mix in the egg yolk until only just combined. 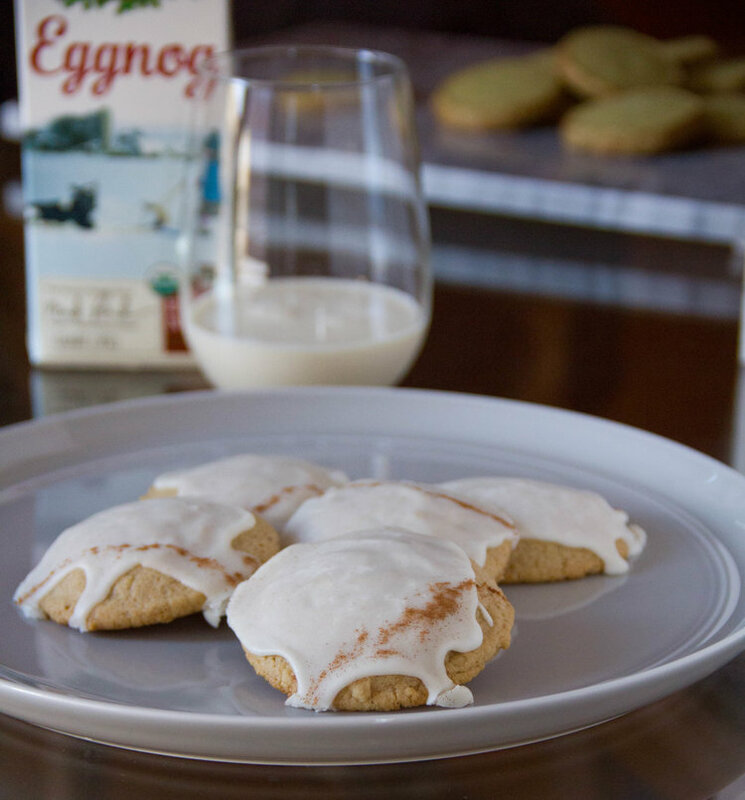 Stir the espresso powder and vanilla into the eggnog, then add to the dough mixture beating until incorporated. In a separate bowl (or if you are lazy like me just dump it in the wet ingredients) whisk together the remaining dry ingredients. Add to the butter and eggnog mixture until just combined. Scoop tablespoons of the dough out onto the prepared baking sheet about 2 inches apart. These will spread. Bake for 11-13 minutes or until the centers are set and the edges are golden brown. Allow to cool for a minute or two on the sheet then transfer to a cooling rack. In a small bowl stir together the powdered sugar and one tablespoon at a time of the eggnog until the mix is only slightly runny. It shouldn't be very thin, but should be able to be poured (like honey). When the cookies have cooled, pour the icing over the middle of the cookies. Sprinkle some extra cinnamon or nutmeg over the top if you like, then allow to set. Beat together the butter and powdered sugar until light and fluffy. Add the yolk and beat until just combined. In a separate bowl, whisk together the flour, pistachio, salt, and matcha powder. Add to the the butter mix and beat until combined and a ball is formed. 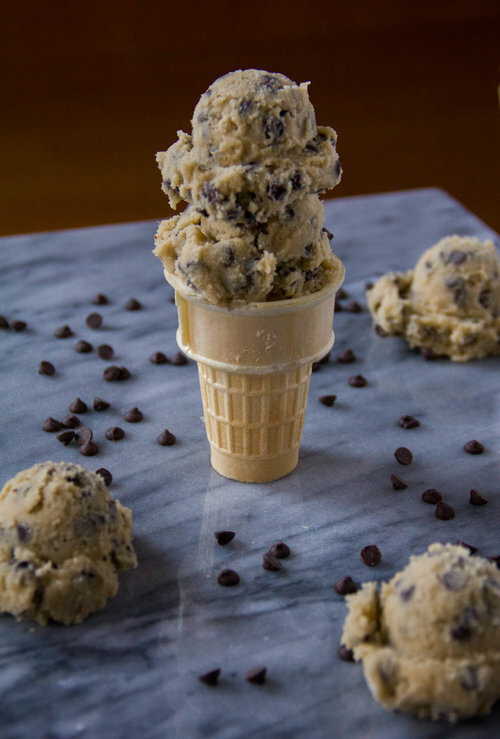 Dump the dough out onto a piece of plastic wrap. Form into a log as best you can and wrap tightly with the plastic wrap. Freeze or refrigerate for 40 mins-1 hour or until firm. Once firm, preheat the oven to 350*F and line a baking sheet with a silpat or parchment paper. Unwrap the dough and roll in the brown or turbinado sugar, pressing down somewhat firmly to ensure the sugar sticks. Cut into slices, roughly a 1/4inch thick and place on baking sheet. Bake for 9-10 minutes. Allow to cool for a minute or two on the sheet then transfer to a cooling rack to finish cooling. Whisk together all of the dry ingredients and set aside. In a separate bowl, beat together the butter, honey, and vanilla. Add the egg and beat until just combined. Stir in the dry ingredients until just combined, then add the chocolate chips stirring until evenly incorporated. Put the dough in the refrigerator for 10-20 minutes to allow to set up slightly. Preheat the oven to 325*F. Line a baking sheet with parchment or a silpat, or grease slightly with butter or a cooking spray. 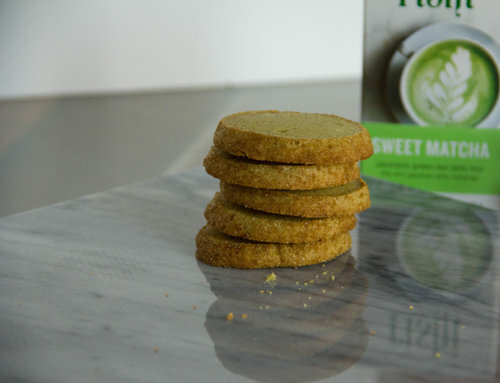 Scoop rounded tablespoons of dough out onto the baking sheet and press down with your hands so they are a normal cookie thickness. These will not spread like a traditional dough. Bake for 10-12 minutes or until golden brown and crispy and around the edges. Cool for a few minutes on the pan before transferring to a wire rack to finish. Preheat the oven to 325*F. Line two baking sheets with parchment paper and set aside. In a big bowl mix together the coconut, dulce de leche, and vanilla until well combined. In a separate bowl, whisk or beat with an electric mixer the egg whites and salt together until you get stiff peaks. Fold the egg whites into the coconut mixture until evenly distributed. Scoop heaping tablespoon mounds of the mixture onto the baking sheet, leaving space in between each ball. Bake for 25 minutes or until edges and tops are golden brown, rotating the pans once during the baking time. Sprinkle with a bit of the flaky sea salt when removed from the oven if not planning to use any chocolate. Allow to cool completely. 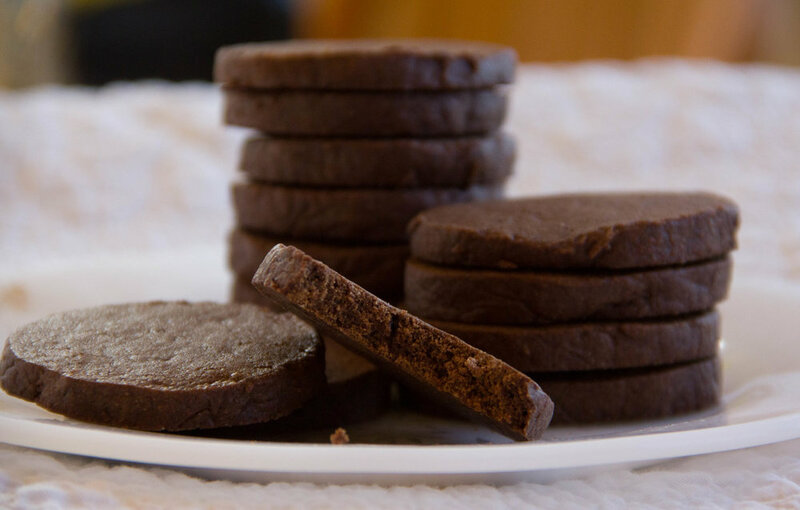 If using the chocolate, melt in the microwave for 45 seconds or over a double boiler until smooth. 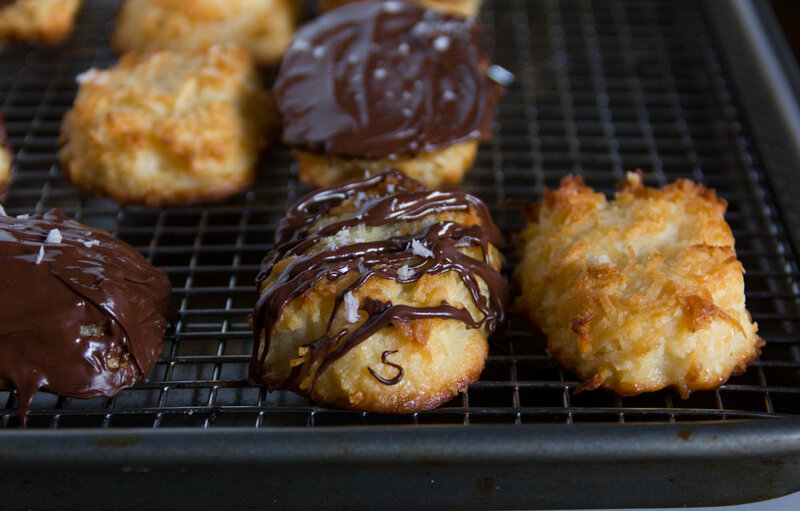 Drizzle or dip each macaroon with the melted chocolate then sprinkle with the sea salt. Allow to set up in the fridge for 30 minutes or so.